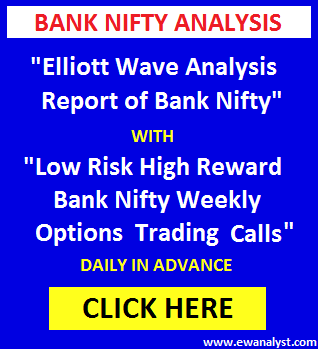 Bank Nifty opened lower at 24934 and bounced to register high 24992 but declined back by more than 250 points to register low 24706 and finally closed 165 points at 24799. 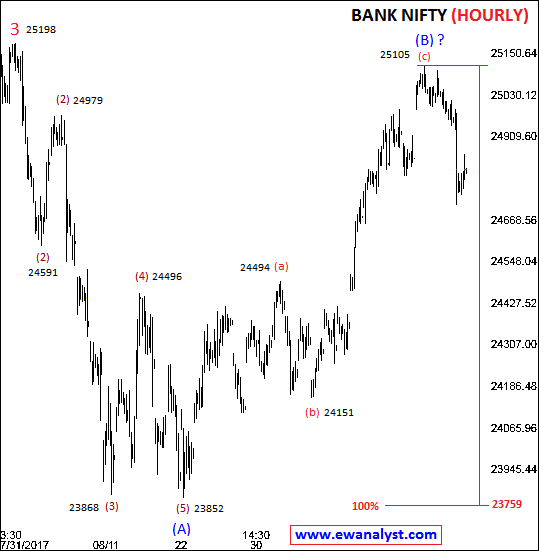 Yesterday, bounce above 25105 was expected and I suggested holding Bank Nifty longs taken in 25000-24977 range with same stoploss of 24937 expecting target 24105 which further can extend towards 25187. Stoploss of 24937 was triggered at opening and Bank Nifty declined further below medium term breakeven point to register low 24706. Now, we need to analyze latest chart to find next move. This is Hourly time bar chart of Bank Nifty Covering move from all time high 25198 which I am expecting as start of corrective pattern. It seems an impulse is already completed from 25198-23852 as marked on chart and this impulse can be wave (A) of correction and wave (B) may be completed at 25105 or still in progress. But wave (B) already achieved normal 61% retracement after breaking above 24683 and retraced more than 78% which is point to keep in mind. 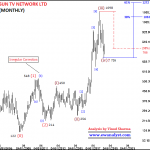 And within wave (B), it seems wave completed from 23852-24494 may be wave (a), wave completed from 24494-24151 may be wave (b) and wave (c) may be completed at 25105 or still in progress. 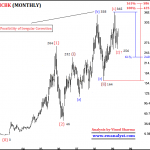 100% projection for bigger wave (C) is placed at 23759 which is the possible target for completion of wave (C) if wave (B) is really completed at 25105. 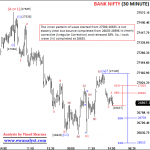 Now, we need to analyze decline from 25105 on separate lowest possible time frame chart. 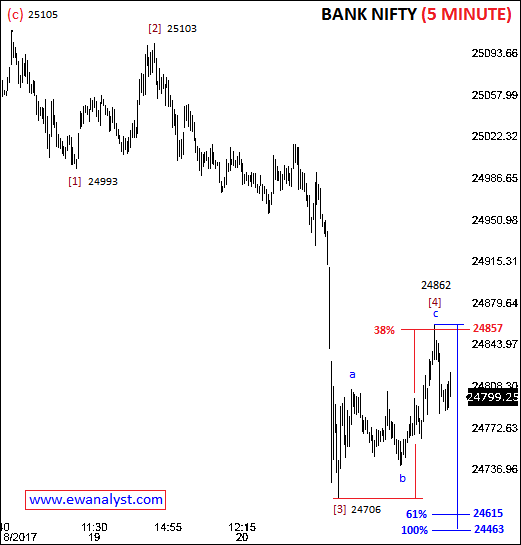 This is 5 min time bar chart of Bank Nifty covering move from high 25105. 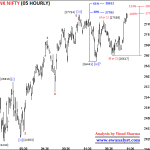 It seems wave completed from 25105-24993 may be wave , wave completed from 24993-25103 may be wave  and wave completed from 25103-24706 may be wave , wave completed from 24706-24862 may be wave  and wave  may be in progress from 24862. 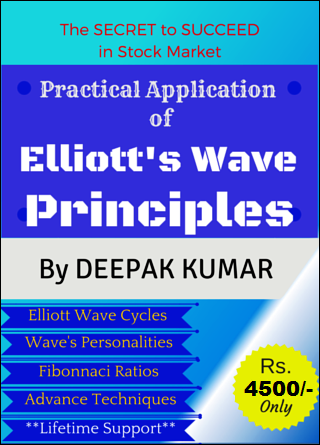 End of wave  is 24706 and 61%-100% projection for wave  is placed at 24615-24463. So, 24706-24615 is the possible target range on downside if wave  is really completed at 24862. 38% retracement of wave  is placed at 24857 which can be referred as breakeven point and same can be used as stoploss for any shorts. 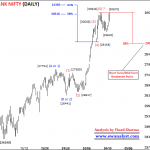 Bank Nifty broke medium term breakeven point 24740 and decline till 24706. 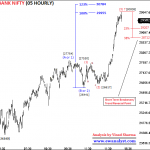 Now, Bank Nifty still has possibility to decline further towards 24706 which can extend towards 24615-24463. And 24857 is the breakeven point above which we can expect further bounce, and same can be used as stoploss for any shorts. 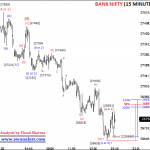 Bank Nifty can be sold in 24799-24857 range using stoploss of 24867 expecting downward targets 24706-24615. Bank Nifty if even touch 24867 then 24700 Sep Call can be bought using stoploss of 24799 expecting upside targets 25000-25198. 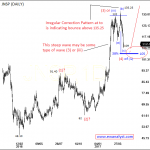 I like your conviction about market, ABC pattern, even i was confused about the counting. Wave A looked proper but there was no Wave B and Wave C. And boom there it is.